Enjoy your time in Porto as much as possible and get to know one of the most famous pilgrimage places in the World, Santiago de Compostela. 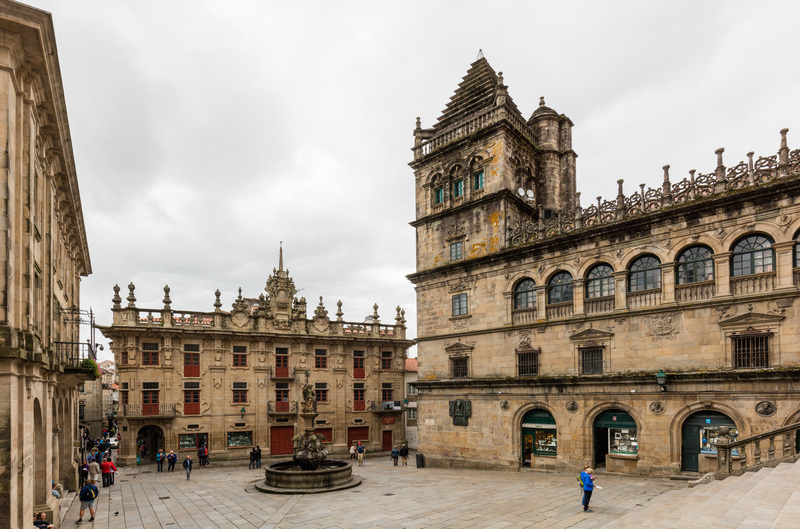 Enjoy this private tour, which you will enjoy in your private luxury vehicle, with a private driver and a private official tour guide in Santiago de Compostela. Get to know the place where is said that St James, one of the 12 Apostles of Christ had been buried, its magnificent cathedral and charming old town, a World Heritage site. On your way back you also enjoy visiting Viana do Castelo, which hosts an incredible basilique in the top of a hill. Taste and enjoy the fantastic portuguese and spanish gastronomy. Enjoy your time in Porto as much as possible and take this private 10 hour tour where you will visit one of the most historical places in Spain, Santiago de Compostela, and a very beautiful town of Portugal, Viana do Castelo. You will get to know the most emblematic and top spots of this wonderful area in your private luxury vehicle, with a private official tour guide in Santiago for 3 hours. We will pick you up from your hotel or place of choice in Porto, and your private driver will take you to Santiago de Compostela. The Tour Travel and More team will help you to organize the best possible tour, adjusting the 10 hours as much as possible to your own interests and likes. With this private tour you will get to know one of the most visited pilgrimage sites in the whole world, Santiago de Compostela. Get to know this World Heritage site where it is said the one of the 12 Apostles of Christ has been buried. Your private driver will pick you up from your place of choice in Porto and start driving North towards Santiago de Compostela. Santiago de Compostela is the final line of the famous ¨Way of St James¨, the city is packed with students (it has one of the oldest universities of Spain), locals, tourists and pilgrims, this gives the place a unique atmosphere. Destroyed by the Muslims at the end of the 10th century, the city was completely rebuilt in the following century. With its Romanesque, Gothic and Baroque buildings, the Old Town of Santiago is one of the most beautiful urban areas of the World. Santiago itself host a very wide variety of monuments and emblematic places, due to all this the city has been declared a World Heritage site. The most known and visited monument of the city is the Cathedral, which is a masterpiece of Romanesque architecture. You will get to know the secrets and history of the city in this private tour, with you private official tour guide, who will show you the most important and interesting places that this magical and historical city offers. After visiting this fantastic spanish old town, you will start driving back to Porto, but you will stop halfway in Viana do Castelo. This city is one of the most beautiful cities of Northern Portugal. It had an important role in the portuguese discoveries, and it has also been one of the main cod fishing area of the country. You will get to visit the Santa Luzia hill, from where you will be able to enjoy a fantastic view of the ocean and the mouth of the river Lima. In the same hill, you will visit the Basilique of the Sacred Heart of Jesus. The tour has a duration of 10 hours from the moment of pick up to the moment of drop off. Remember the tour is 100% adaptable to your own interests and likes. It is possible to do a longer tour experience as well, please don’t hesitate in contacting us if you have any doubts. Porto is the second biggest city in Portugal after Lisbon, it has a population of 225.000 people. The city has been declared a World Heritage site by the UNESCO in 1996. The region is very well known for the production of a local wine called Oporto. Even being a small city, Porto has a very wide offer of monuments and a very long and strong history. It has always been a very cultural city, and which hosts a very good gastronomy.